Richard Ansdell RA (11 May 1815 – 20 April 1885) was an English oil painter of animals and genre scenes. He was also an engraver. 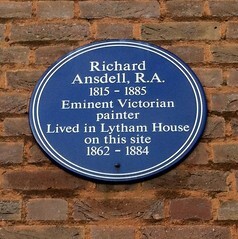 Richard Ansdell RA, eminent Victorian painter 1815-85. In 1861 he built his home, "The Starr Hills", in the surrounding sand dunes, which inspired him. The local area was named after him.